Are you looking for a fun and stylish SUV that's not too big? With seating for five adults and plenty of standard comfort and convenience features, the 2016 Nissan Murano is the perfect mid-sized crossover utility vehicle (CUV). At Sutherlin Nissan of Ft. Myers, FL we offer all of the Nissan models, including the fun Murano. Sutherlin Nissan of Ft. Myers sells other Nissan crossovers and SUVs as well. We have vehicles with a range of options and packages, so there is bound to be something for any taste or budget. Check our inventory online or visit our dealership. We are proud to offer great Nissan vehicles and great Nissan service to customers in Ft. Myers, and Naples from our dealership at 13985 S Tamiami Trl in Fort Myers. Get in touch with us today and schedule a test drive. 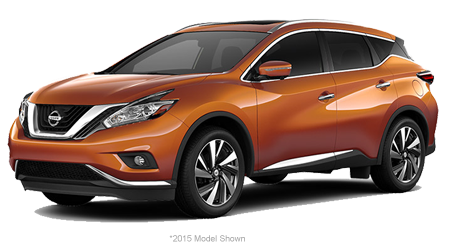 The 2016 Nissan Murano delivers great performance to match the stylish exterior. The 3.5-liter DOHC V6 engine produces 260 horsepower, without wasting fuel. A modern engine design and a continuously variable transmission allow the Murano to deliver an EPA-estimated 21 city and 28 highway miles per gallon. The handling is pretty good too! You get great handling too. The combination of front-wheel drive, front and rear stabilizer bars, and four-wheel disc brakes produce an SUV that steers and stops smoothly even in poor road conditions. The optional all-wheel drive offers an extra measure of control. Safety is a top priority in all Nissan vehicles. In keeping with this safety orientation, the 2016 Murano comes with numerous safety and security features. The interior has advanced two-stage airbags in the front, supplemental side airbags, side curtain airbags, three-point seat-belts, and active head restraints for an added degree of protection. The ABS, brake assist, and electronic brake-force distribution help you stay in control on the road. Starting off on an incline is easier and safer with the standard hill start assist feature. The standard traction control and the (available) all-wheel drive make it even easier to stay in control when the road turns unfriendly. Buyers with small children will like the standard LATCH anchoring system for child seats. A security system and a vehicle immobilizer help to secure the vehicle and its contents. You can count on the Murano to keep you safe in any road conditions! The cool 2016 Murano exemplifies Nissan engineering and design; it delivers a safe, efficient, and fun driving experience. If you want a mid-sized crossover that is packed with features are looking for a crossover vehicle that offers a ton of great features at a reasonable price, then the Murano is the perfect vehicle for you. At Premier Nissan, we look forward to showing you our selection of Muranos and helping you find the specific one that works best for you. You can check our inventory online, or you can see us. Our dealership is located at 13985 S Tamiami Trl in Fort Myers, FL. We are just down the road from car buyers in Ft. Myers, and Naples FL. Come and test drive a Murano today!